The alpine meadows are predominantly used to raise and fatten heifers. Today 3,500 hectares of pasture are available for summer grazing of around 4,000 head of cattle (Photo credits: Frédéric Ravenot). The village communities of the piedmont have coveted the alpine grasslands since the Middle Ages, for summer pasturing and hay harvesting. 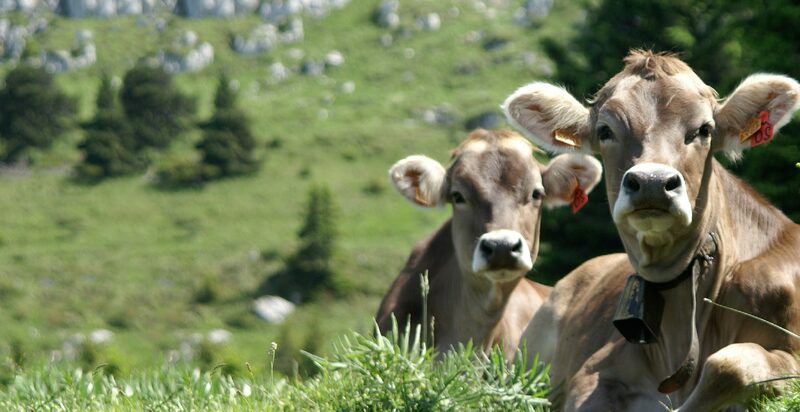 From the 17th century onwards the alpine pastures throughout the High Jura were used for the production of gruyère cheese. Traditionally, each pasture area was operated by a team consisting of the cheese maker, two or three shepherds and several children, all of whom, apart from making the cheese and looking after the livestock, helped to maintain the grassland. However, leading the cattle to pasture, upkeep of the “goyas” (man-made ponds), spreading manure, eradication of unwanted plants (scrub, False Helleborine, Great Yellow Gentian, Thistles), collection of firewood and production of cheese was essentially the work of the shepherds. This system lasted until 1960. At the beginning of the 1980s, milk cattle were no longer taken up to the alpine pastures and cheese making (Comté and Bleu de Gex) ceased. The pastures were then used for the raising and fattening up of heifers. Today, 3,500 hectares of summer pasture are available for up to 4,000 head of livestock (mostly cattle with a few flocks of sheep or goats or herds of horses). The absence of shepherds changed the habits of the herds. Pressure on the land changed, certain areas were abandoned, others unevenly pastured. This led to the closing up of pastures, the encroachment of the forest, the colonization of grassland and meadows by pioneer or invasive species, or by plants lacking any fodder value. 41 alpine « chalets » (alpine farms) dot the High Jura. Most retain a pastoral nature, but are no longer used as constantly as they were in the past. The byres are no longer used for the shelter or the milking of livestock and the absence of a shepherd means that the accommodation is no longer used. However, four mountain farms are still used for grazing purposes, La Maréchaude, Varambon, Curson, le Crozat. Such mountain farms are typical of the High Jura grazing lands. They are seen as an essential part of the mountain farming heritage reflecting the pastoral practices dating from the 18th to the 20th century. In order to preserve the typical architectural features of these Jura mountain farms, the PNR of the High Jura has published a guide to restoration (DRAUSSIN, 2007), these restoration guidelines are directly implemented in the planning permits issued by the Prefect. In 2014, the Ain Departmental Council (Conseil départemental de l’Ain – CD01) acquired the Chenaillette property and in July 2014 it was designated a sensitive natural area (Espace naturel sensible – ENS). An integrated management plan, Plan de gestion intégré (PGI), was launched for this property with the aim of restoring pastoral activity compatible with the cultural heritage and environmental issues specific to this site: presence of the Tetraonidae family, maintenance of the wooded meadows and the restoration of the alpine farms (road access, roof and structural upkeep, creation of “goyas”, renovation of water cisterns, etc.). The Reserve is a partner in this project and is a participant on the ENS committees organised by the Department. As well as the PGI of the Chenaillette the CD01 assists the Natural Reserve financially with numerous projects (school activities, genetic studies of the Capercaillie, communication, etc.). The two bodies have had a partnership agreement since 2015.